1) The Kings are not attacked at all. 2) All other pieces are attacked exactly once. Ignore color, so every piece attacks every other piece whose square it can move to, including the Kings. I don't know how many solutions there are, but there is at least one. I'm not trying to solve the puzzle, I'm just interested in how many solutions there are, since the OP claims he doesn't know. I brute forced it with a program. 264 solutions, not taking rotations and reflections into account. However, there are only 36 unique configurations. 30 of these solutions are multiplied by 8 (4 rotations * 2 reflections), while the other 6 only by 4. This is because the solution is already its own reflection. First of all, there are 32432400 configurations, not taking rotations and reflections into account. 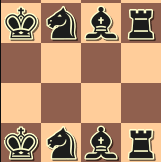 Since the board has 16 squares, if we were to place the two kings anywhere, we'd be looking at their combinations using the formula C(16, 2). 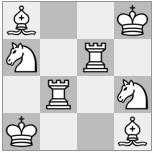 The knights would now have 14 available squares, so multiply the previous result with C(14, 2), etc. generated the piece configurations, checked for validity and saved the solutions. The numbers for each solution represent the board squares, with the kings placed first, then the knights, then the rooks and then the bishops. For example, Skyvask's solution is (2, 13, 0, 15, 7, 8, 1, 14). The complete list can be found here and the unique solutions here. # so we can exclude rooks and bishops there. # may be blocked by the time every piece is on the board. One can print a board representation of the solutions with the following function. (bonus #2 is we can multiply this by 4 orientations of the board). I wrote a quick little program to work them out; I agree with Reti43 that there are 264 with rotations and reflections, and 36 without. The 36 possibilities are listed below, and I've included also the C# code if someone wants to play with it further. I represent boards as immutable bit vectors, so that they're nicely compact in memory and fast to compute. The core algorithm is just a big query comprehension. My solution is not exactly exemplary code in either its design or execution; I wrote it very quickly and it is just brute force with ad-hoc pruning to quickly discard boards that can't work. A more sophisticated approach would be to use a backtracking constraint satisfaction solver, like you do for sudoku solvers. // Are k1 and k2 adjacent as far as kings are concerned? // Crappy n-squared algorithm is the best we can do without a hash code. 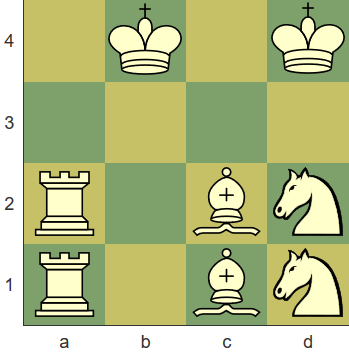 This solution defied my initial intuition: that the bishops would share diagonals with the two middle squares attacked by the knights - intuitively that would minimise the number of squares under attack, which is quite in line with the problem! 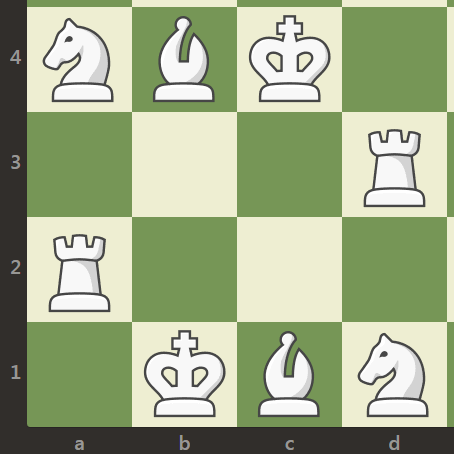 Can more than 24 knights of each color be placed on a chessboard without any pieces attacking opposite color?